That’s the ratio one self-publisher found was needed to extract paid sales from free books. I’ve lost count how many people have downloaded the eBook but the last time I audited the figures, which was around six months after the book’s release, it’d seen around 500,000 downloads. I suspect that number has doubled since then. Since going on sale at the start of 2009, the book has made me $9,000. Bearing in mind the book took three months to produce, that’s a salary of $3,000 per month, although costs such as hosting have to be deducted, and I also spent quite a few days marketing the book once published. I estimate I have to give away 446 copies of the eBook for every sale of the print edition. Without Amazon S3, I simply couldn’t have done it. The book’s been a success in terms of providing a free educational resource for the Ubuntu community, and I’m very proud of this achievement. But as a commercial endeavour, I wouldn’t recommend anybody take a self-publishing route. 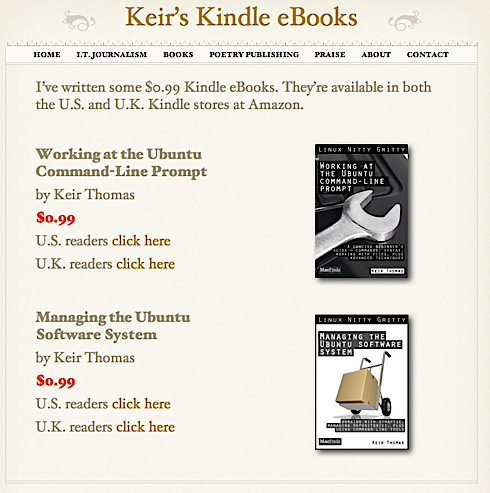 Thomas is now trying a new experiment, selling Kindle versions of two new books at 99 cents.